For new lawns work in 1 to 3 inches of Earthbank fish compost into the top 3 to 4 inches of soil depending on the quality of the soil. Poor soil will need about 3 inches of compost and very good soil requires only about an inch of compost. Add sod, or plant with seed as usual. 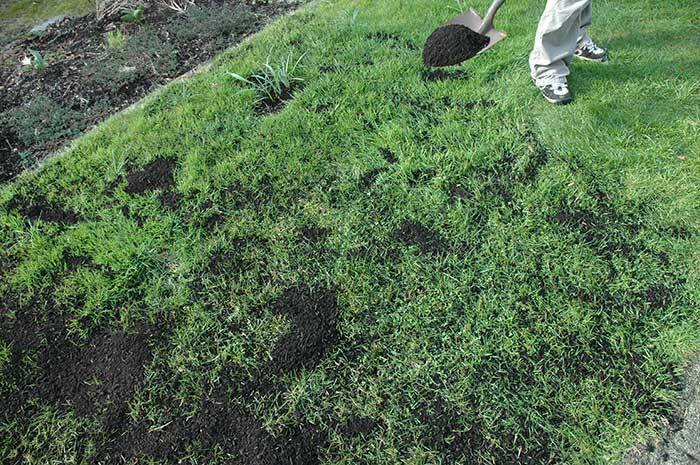 For existing lawns cover the area lightly with 1/4 inch to 1/2 inch of compost. Using a flexible grass rake, then distribute and rake in as evenly as possible and then water thoroughly. This procedure can be repeated several times as the grass grows into the compost. Please see procedure demonstrated in the photo gallery. Keep in mind that lawns can be considered heavy feeders if you want a green, lush lawn. If this is your objective then best results will be achieved with liberal doses of fish compost.